Both these cars redefined all-road all-weather performance. But could a 1989 Audi possibly teach today’s GT-R any tricks? It is possible, I wonder, to write this feature comparing the merits and similarities of the Audi Quattro 20V and it latter-day equivalent, the latest 2017 model year Nissan GT-R, without mentioning the phrase Vorsprung durch Technik? Oh well, there you go. Failed already. Yet Audi’s much-parodied marketing mantra epitomises what this particular comparison is all about. Created in the early 1970s, then dropped quietly a few years later before being resurrected so memorably in the ’80s to advertise the then-brand-new Quattro among other four-wheel-drive Audis, it is the very meaning of Vorsprung durch Technik – progress through technology – that so obviously links Quattro 20V to GT-R. 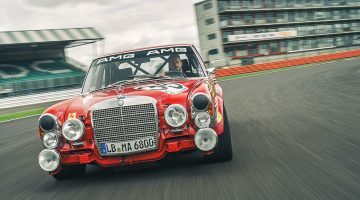 Both represent cutting-edge technical genius on the part of their respective manufacturers, albeit expressed in a somewhat different way and separated by nearly three decades. Both cars, ultimately, are led by technology. And both cars, in their own way, pretty much obliterated any sort of competition when they were first introduced. I can remember their impact vividly because I was present for the launches of both vehicles. Yes, I really am that old. As a wide-eyed road tester working for What Car? magazine in the late 1980s, I somehow found myself at the premiere of the Quattro 20V in 1989, and subsequently spent the thick end of a week in one in the region. And it was an experience I will never, ever forget. The car was that good, that quick, that special. A couple of decades later, I was at the Sendai Hi-Land Raceway in Japan, where the very first of the current breed of R35 GT-Rs were being introduced to the world’s press. And I distinctly remember having similar feelings about this car to the ones I’d had about the 20V Quattro back in its day: that it could do things that other cars at this price level simply could not do. That it could stop for, go around, and then accelerate out of corners in a way that shouldn’t really be possible in a car that wears number plates and has four seats and a decent-sized boot. Both cars, at their introduction, blew my mind, quite frankly. And now here we are again, almost 30 years after the 20V Quattro exploded onto the scene and fully ten years since that original December 2007 launch of the R35 GT-R, and I absolutely cannot wait to put these two together. To drive them back-to-back over the same roads, just to see. Squaring up to one another in a Welsh hillside car park, the GT-R absolutely dwarfs the Quattro physically. Back in the day, I remember thinking that the Audi looked impossibly tough, especially around its rear haunches. It was a big, intimidating car relative to most other stuff around at that time. In 1989, it really did seem like it was king of the road, dynamically, physically, and actually. But it looks positively dainty today, almost to the point of appearing to be a bit weedy beside the kraken of a car that is the GT-R. The Quattro’s 15-inch wheels seemed to fill those blistered arches quite perfectly in its heyday, but now they look small and insignificant and just nowhere near big enough beside the Nissan’s 20- inch alloys and ultra-low-profile tyres that come seemingly within a millimetre or two of scraping the wheelarch liners, even when the car’s at rest. Here’s the thing, though: the Quattro’s stated kerbweight in 1989 was a mere 1350kg, whereas the Nissan’s today is a whopping 1752kg. That’s not far off an entire Caterham’s worth of weight difference, and you can see it with your own eyes when they are side by side. And yet, of the two, it’s the Quattro that has by far the more interior space. You could carry four adults with no problem whatsoever in the Audi. To do so in the Nissan you need to put the big electric front seats all the way forwards, which makes driving it impossible, and then take a chainsaw to remove the lower parts of the rear passengers’ legs. And remember, the Audi is around 30cm shorter than the Nissan as well. So being 28 years younger hasn’t done much for the packaging of the GT-R, which is effectively a two-seater with an extra bit of space for luggage (in addition to the admittedly enormous boot) behind the front seats. Anyway, initial impressions on their relative size and packaging successes are one thing, but driving them is what we’re here to do, and with both cars there is so much to savour. I plump for the Audi first because I haven’t even seen one of these things in the last ten years, let alone sat in one or, better still, driven one. The moment you start to engage with the Quattro, it feels both lovely but also undeniably old and antiquated. Even just a simple pull on a door handle reminds you of yesteryear. The handle itself looks and feels from another era – cold but strangely pleasing to the touch – and there’s actually something called a key that you need to insert to open the door if it’s locked. And when you pull on the handle it kind of clanks in your hand, then the door itself feels light and peculiarly insubstantial as you pull it open. Which is the exact opposite to the way I remember the door of a 20V Quattro feeling in 1989. 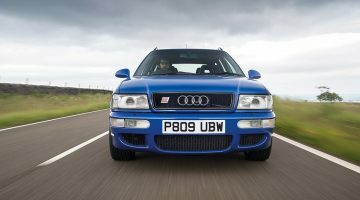 Back then, this car felt impossibly strong and well-made alongside everything else that was on sale, but progress – or more to the point the obsession with safety features – means the door of almost any modern car feels meatier than that of an Audi Quattro. And I’m not sure whether that’s a good or a bad thing on balance. Climb inside the Audi and the sense of antiquation becomes even more marked in certain areas. Like the driving position, and the seats, and the unlit Blaupunkt stereo, and the sliding heater controls, and the indicator stalks that feel as though they are breaking slightly every time you use them, and the fact there are bumps in the floor, due to the addition of dual catalyst exhausts. The driving position itself is a bit of a shocker to be honest, but chiefly because I don’t remember it being anywhere near this bad in terms of how far offset the steering wheel is relative to the pedals. The centre of the wheel is directly in line with the clutch pedal, so it feels rather as though you’re driving the car from the wrong seat. And the pedals themselves are all heavy and clumsy in operation (always were in Audis, and for a long time after this). There’s a distinctive aroma, too: a mix of oil, fuel and damp carpets; the smell of a 30-year-old car, essentially, even though this one has been looked after as well as any. It’s the digitised instruments that are the most dating feature of all, though. They were cutting edge in their day, but now – like many things that were once deemed revolutionary – they appear embarrassingly archaic. They look like they were designed by the same person who created the sets for Blake’s 7, and you can’t help but smile the first time you twist the key in the ignition and they light up in front of you, glowing red-on-black, much like a Casio watch from 1978. Normally you’d expect things to go from bad to worse when you start driving a car of this age, but the opposite turns out to be the case in the Quattro 20V and it’s a cause of genuine delight. This one’s covered 128,000 kilometres but is in fine fettle, and the turbocharged motor itself feels sweet as a nut. It’s pretty much how I remember it, in fact, with a lovely, smooth refinement to it on tickover and a strange absence of the five-cylinder thrum you’d expect. The 20V versions never had that, though, instead being quieter, more efficient and more powerful than the earlier cars. In this day and age, 217bhp from a 2.2-litre five-cylinder engine is nothing special, let’s face it, but back then it was pretty tasty, and even in 2017 the Quattro still feels decently brisk – and impressively lag-free – when you open it up. True, the clutch is ridiculously heavy and the gearchange is far too long-winded (again, always was) but the way the 20V goes is still not to be sniffed at, especially between 2000 and 4500rpm where it still feels genuinely potent. I have to admit I wasn’t expecting that. After the GT-R that I’d arrived in, I thought the Audi would feel hopelessly undercooked in terms of pure, straight- line acceleration, but no; it still feels lively and energetic and crisp in its delivery – to a point where I reckon it could still live with something like a Golf GTI today. Which might not sound like the statement of the year but is actually pretty surprising if you think about it, given the rate of progress in recent times. It even steers quite sweetly, and goes round corners with a fair bit more precision than I was expecting, even if it does feel its years when it comes to outright grip levels and damping over our test route’s worst imperfections, of which there are many. It doesn’t feel glued to the tarmac in the way it did in 1989, nothing like, but neither does it feel as though it will roll over itself and fall off the road if you drive it quickly, which is how most cars from this era now feel, especially when compared with their modern equivalents (doubly so when that modern equivalent is a GT-R). Fact is, I find myself driving the 20V Quattro harder than I thought I was going to over this road, and it behaves better than I thought it would. In many areas it really does feel like a relic, never more so than in its front seats, which appear to provide no support whatsoever when you’re travelling a bit, whereas as I remember them feeling so incredibly sporting way back when. But on the move, and simply to drive, it still feels remarkably tidy. In fundamental terms, it is still a surprisingly well sorted car, one that goes and grips and steers a whole lot better than I expected it to all this time after it was invented. And it also still happens to look rather lovely in the metal, perhaps especially so in 2017. Not as mean and muscular and naughty as it did when Brit designer Martin Smith first unveiled his work of genius to the world back in the 1980s, no, but it still looks right. Still looks fundamentally correct in all its proportions. Still looks great, all these years later, even beside a 2017 model year Nissan GT-R.
And so what does the Nissan feel like after spending the thick end of a day behind the wheel of the car that provided much of the inspiration for its very being? Like a car from a different solar system, if I’m brutally honest. Mostly that’s a good thing and represents progress on Nissan’s behalf. The 562bhp GT-R is massively faster and more capable than the Quattro, of course it is. It also feels much more expensive and luxurious and modern inside. It has everything you could ever wish for in terms of specification, with multi-adjustable air con, electric motors that move the seats, multiple data- logging facilities in its computerised infotainment screen, satellite navigation, a stereo that will make your eardrums explode if you want them to. And it feels like a hugely more sophisticated car than the Quattro as a result. 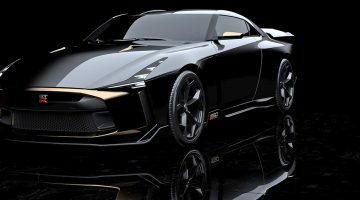 But there are aspects of the GT-R that you do wonder about, have always wondered about, and driving the Quattro 20V beside it brings those aspects more sharply into focus than ever before. They are, very simply, its size, its weight and its frankly ridiculous packaging. Spending a day with the Quattro has made me wonder more than ever if the GT-R really needs to be as big and heavy as it is, given how much space inside it categorically doesn’t have. And the answer is no, it absolutely does not need to be this huge, or this heavy. So, even 30 years later, the Quattro is still serving up lessons to the rest of the car world, and I suspect it’s one of those rare cars that we will continue to learn from as time goes by – including the magicians who design and build the modern-day legend that is the Nissan GT-R. It’s always good to remember: just occasionally less is more, even in a car that is led by technology. Previous Article2018 Jaguar XE SV Project 8 review – is this SVO’s best project yet? Next Article 2018 Aston Martin DB11 AMR review – a better car, but is it a better DB11?